Inez Milholland books are a great gift idea! You’ll be doing your part by getting prepared for the 2020 national centennial observance by purchasing Remembering Inez: The Last Campaign of Inez Milholland, Suffrage Martyr by Robert P.J. Cooney, Jr. Remembering Inez presents images and primary documents associated with Milholland’s life and times that haven’t been in general circulation before this. 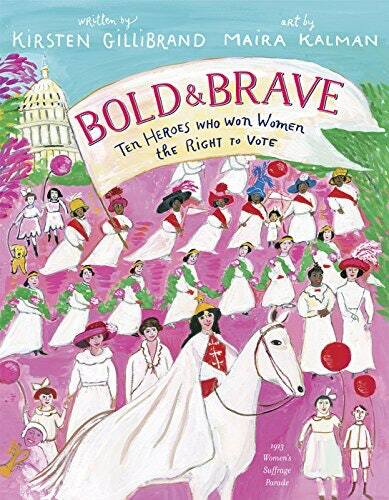 November 2018 was the publication date for a new book with Inez Milholland on the cover: “Bold and brave: Ten Heroes who won women the right to vote” by Kirsten Gillibrand and Maira Kalman. The Cooney book highlights impressive photography of the period and what Inez Milholland’s contemporaries had to say about her. Robert P.J. Cooney, Jr. is the author of Winning the Vote: The Triumph of the American Woman Suffrage Movement , a classic work that details the many campaigns involved with winning votes for women before 1920. Winning the Vote was produced in conjunction with the National Women’s History Project. It’s a basic reference book worth owning, loaded with images that will keep you fascinated from page one to the end, and it’s a hefty tome indeed that anyone interested in the suffrage movement shouldn’t be without. Follow SuffrageCentennials.com with an email subscription, Twitter, or Facebook. This entry was posted on December 1, 2018, in Blog and tagged 2020 suffrage centennial, Bob Cooney, Inez Milholland. Bookmark the permalink.